offered by the Regina Kennel and Obedience Club – serving our community and their dogs since 1916. We are MUCH MORE than a training facility. We are a club dedicated to bringing dog fanciers together and teaching people how to have FUN with their pets! Our professional instructors have many years of experience training, showing and caring for all breeds and cross breeds! The training facility is centrally located at 1826 McAra Street and offers a fully matted ring, clean and spacious building, and accessible parking. Your dog will love it here!! LOW LOW Prices! Conformation classes are $85 for the 6 week set of one hour classes each week. 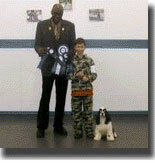 Obedience and Rally Classes price is $85 for the 6 week set of one hour classes each week. 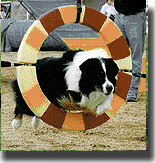 Agility classes are $95 for the 6 week set of one hour classes each week. Taxes included. Please call 761-2813 or 359-6909 or email training@reginakennelclub.ca to register today! Check our website often – we have classes starting on a regular basis.